Eric Cutter, Director of Distributed Energy Resources will be presenting on the value of bidding storage into Independent System Operator (ISO) markets with increasing amounts of renewable generation at Storage Week in San Francisco on Tuesday, February 27th at 10:30 a.m. Today the most attractive ISO ancillary service (AS) market for energy storage is frequency regulation, which is primarily a capacity (kW) service. But the market size for frequency regulation is relatively small and easily saturated as more storage and flexible loads participate. Furthermore, a key driver of frequency regulation prices is the opportunity cost of lost revenue in energy markets. Eric will show that during curtailment of renewable generation, with associated zero or negative energy prices, the opportunity cost of providing both Regulation Up and Regulation Down falls to zero. Under higher renewables, the more lucrative AS markets will be load following and reserves, with a much heavier emphasis on energy (kWh) than capacity (kW) as compared to today. 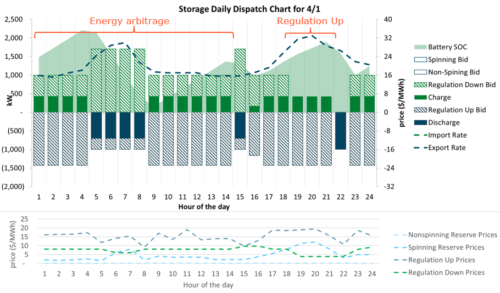 Energy Storage developers must design their systems to maximize frequency regulation revenues today while anticipating bidding more energy intensive services into ISO markets in the future.